Dnepropetrovsk metro is the youngest and the smallest metro in Ukraine.It was launched on the 29th December 1995 and consists of 6 stations, located on one line, whose length is 7,1 km. The metro is entirely located in the right-side part of the city and is not very popular with inhabitants, as it is not very long. The past and present of Dnepropetrovsk metro. 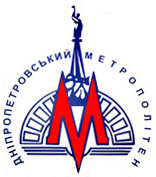 The future of Dnepropetrovsk metro, projects. Pictures and descriptions of all Dnepropetrovsk metro stations. Collection of different Dnepropetrovsk metro maps. Audio ads in train cars (in mp3). A collection of films and videos on Dnepropetrovsk Metro. Authors: Dmitry Aksenov, Oleg Totsky and Аrtem Kostyuk.